Six More Features We Wish Tata Harrier SUV Had! Home Cars News Six More Features We Wish Tata Harrier SUV Had! 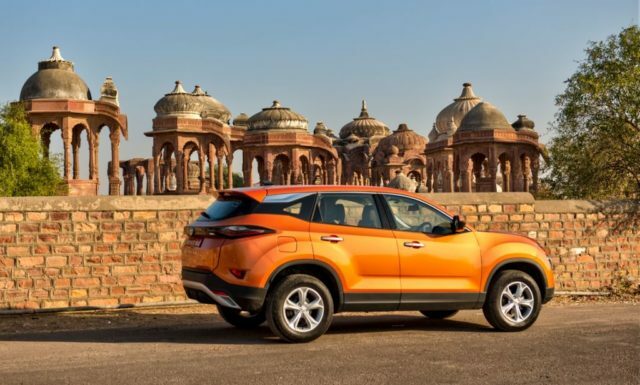 Make no mistake, Tata Motors will be launching its long-awaited Harrier SUV next month in India with a feature-rich package. The Harrier is expected to have on-road pricing of Rs. 16-21 lakh – effectively positioned to rival Hyundai Creta and Jeep Compass. The Indian manufacturer took the years of learning from JLR and crafted an all-new premium SUV for the domestic customers in Harrier. All the key details regarding the five-seater Harrier have been revealed in XE, XM, XT and XZ grades. It measures 4,598 mm long, 1,894 mm wide, 1,706 mm tall and has a wheelbase similar to Discovery Sport at 2,741 mm as it is based on Land Rover’s D8 architecture dubbed as OMEGA. It boasts a ground clearance of 205 mm and 425 litres of bootspace that can be expanded to 810 litres. The range-topping XZ variant comes loaded with features like Xenon HID projector lamps, 8.8-inch HD touchscreen infotainment system, 9 JBL speakers, 6 airbags, ESP with roll over mitigation, HHC, HDC, CSC, ETC, leather seat upholstery and door pad inserts, outer mirrors with logo projection, 7-inch colour TFT instrumentation, terrain response modes (Normal, Rough, Wet), oak brown interior theme, front fog lamps with cornering function, etc. All these are essential and trendy features a modern day customer would definitely seek and they would have distanced Harrier from the rest of the competition further. Perhaps, Tata would reserve some of these features for the seven-seater variant coming out within a year of the Harrier’s debut with a different nomenclature? The Harrier takes power from a 2.0-litre Kryotec inline four-cylinder turbocharged BSIV diesel engine that produces 140 PS at 3,750 rpm and 350 Nm at 1,750-2,500 rpm. It will initially be offered only with a six-speed manual transmission. The Harrier will be available in five colour choices such as Calisto Copper, Ariel Silver, Thermisto Gold, Orcus White and Telesto Grey. The entry-level XE will only be sold in Orcus White while XM in all colours barring Calisto Copper.